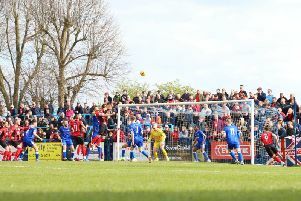 Kettering Town head to Banbury United this weekend having been knocked off top spot in the Evo-Stik League South Premier Division Central in midweek. Stourbridge’s 0-0 draw at Banbury on Tuesday night saw them move a point clear at the summit, although the Poppies now have three games in hand on their fellow high-flyers. For the time being, a two-horse race has developed at the top with third-placed Biggleswade Town currently 10 points adrift of Law’s team who returned to winning ways with a 3-0 home win over Lowestoft Town last weekend. And the Kettering boss insists he is only focused on getting another big away performance out of his team. The Poppies are unbeaten in their nine away league matches so far this season but that record looks set for a thorough examination against a Banbury side who have drawn five and won one of their last six games. “The result in the week just shows that the league is a bit more open than some think," Law said. “I think that was Stourbridge’s fourth away game in a row so there was probably going to be a stutter somewhere along the line. “It obviously could have been worse for us, we could have been three points behind instead of one. “We have three games in hand but that just brings pressure to go and perform in them when they come around. “All we can do is keep trying to do what we have done to get ourselves into this position. “Tuesday’s result shows we are in for a tough game at Banbury but we knew that already. “They are on a decent run, they play a good style of football and they will have done their research on us. Law expects defender Declan Towers to be fit after he was withdrawn as a precaution with 15 minutes to play against Lowestoft last weekend. But Aaron O’Connor’s knee injury, which saw him forced off early in the second half, will be assessed ahead of the game.